In line for top job? Sundar Pichai, a rising start at Google. In an internal memo sent to Google staff, CEO Larry Page, has apparently promoted Sundar Pichai to the role of a super vice president, as the former bestows more of his responsibilities on the latter. Pichai is already in charge of some of some of Google's key product (Chrome, Apps and Android) and, according to Re/code, he will now inherit most of, well, everything else. Research, search, maps, Google+, commerce and ad products and infrastructure will fall under his remit with six executives now reporting to him rather than Larry Page. The change came along as Page highlighted the fact that Google will become less innovative as it matures; the changes, he argues, will help him focus on existing and new products. Page will continue to oversee access and energy, Nest, Calico, Google X, corporate development, legal, finance and business. Youtube still remains fiercely independent with Susan Wojcicki at the helm. 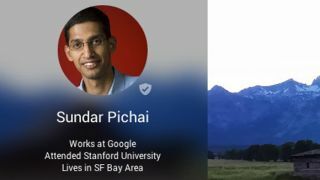 For Pichai, it has been a remarkable rise within Google, one which went ballistic over the last two yeas as he picked Google Apps in 2012 and Android in 2013. Google has recently added new hardware (Nexus 6 and Nexus 9) to its product line and is busy lining up the next iteration of Android (v5.0, otherwise known as Lollipop).